US President George W Bush has signed a law designed to force doctors to keep a severely brain-damaged woman alive. The legislation was passed by both houses of Congress after an impassioned debate and approved by the president in the early hours of Monday. 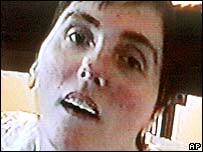 It calls for a federal court to review the case of Terri Schiavo, who has been in a vegetative state for 15 years. A judge in Florida is now considering whether to allow a feeding tube - removed on Friday - to be put back. A decision is expected later on Monday. Your say: Who should decide? Mrs Schiavo's father, Bob Schindler, who says his daughter is responsive, told reporters he had given her the news. "I told her if she was ready, to take a ride to get some breakfast, and she gave a great smile," he said. Mrs Schiavo's parents have spent seven years fighting to keep her alive, saying she can still lead a fulfilling life. But her husband Michael, her legal guardian, petitioned to let her die. Mr Schiavo, who has since started a family with another woman, says his wife would not want to be kept alive in her current condition. "This is a sad day for Terri," he told ABC's "Good Morning America" on Monday. "But I'll tell you what: it's also is a sad day for everyone in this country because the United States government is going to come in and trample all over your personal, family matters." Congress intervened after a Florida judge allowed the tube to be removed at her husband's request. Mrs Schiavo is expected to die within two weeks unless the Florida ruling is overturned and the tube reinserted. Mr Bush returned early from a weekend in Texas to sign the bill, shortly after it was passed by the House of Representatives. "In cases like this one, where there are serious questions and substantial doubts, our society, our laws, and our courts should have a presumption in favour of life," Mr Bush said in a statement. Mrs Schiavo's sister welcomed the new law. "We are very, very, very thankful to have crossed this bridge and we are very hopeful, very hopeful that the federal courts will follow the will of Congress and save my sister's life," said Suzanne Vitadamo. The Senate approved the bill on Sunday. The BBC's James Coomarasamy says that during the debate many congressmen and women talked about their experiences of death. Republicans said it was their duty to save a life that was still worth living. If they did not act now, one said, Mrs Schiavo's blood would be on their hands. Democratic opponents of the bill argued that it was wrong for Congress to play doctor or God and that overruling the state court's decision to allow the brain-damaged woman to die would set a worrying precedent. Mrs Schiavo lapsed into her present state after her heart stopped beating temporarily in 1990. 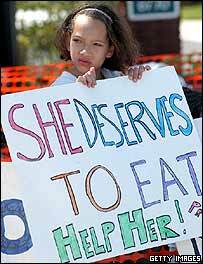 The case has galvanised activists from both sides of the euthanasia debate. The feeding tube has been removed twice before. Both times campaigners successfully launched moves to have it replaced.